Dal Bhat, although delicious, healthy and varied, is way too overserved and overeaten! 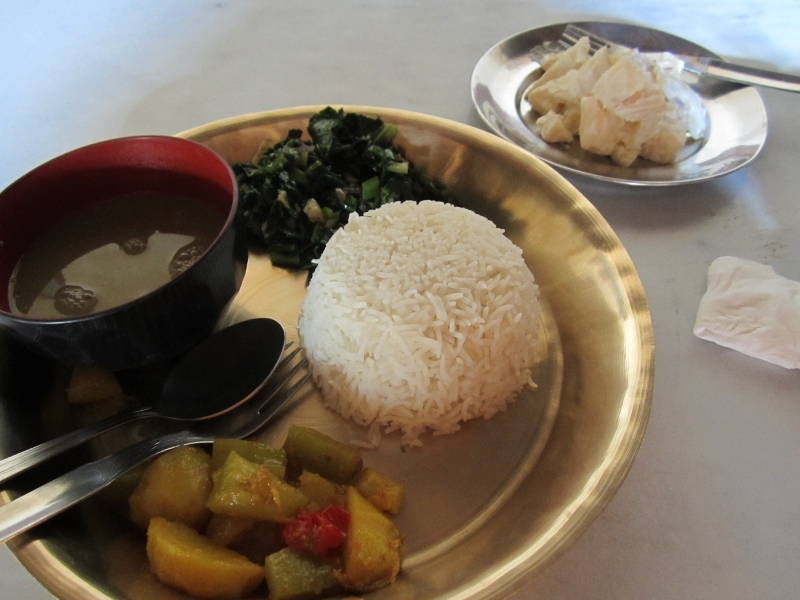 Dal Bhat is the national Nepali dish. It always has rice and lentils accompanied by a few side dishes of various vegetables and sometimes a little bit of meat. It is a fairly healthy dish: you get steamed rice, the lentils are in a stew that is borderline soup, usually there are potatoes, the rest of the vegetables are lightly fried, you also get a fried papad (aka papadum) which is a very thin and crispy flour 'cracker' (sometimes you can also get a prawn cracker instead) and then a few pieces of meat (if you order non-veg) are served in a curry. Dal Bhat is usually served on a large metal dish and the lentils are served separately in a small bowl. The first time we ordered Dal Bhat in Thamel, Kathmandu, we felt very bad because we shared one order and we got unlimited refills; all for one, fixed price. We figured out that free second, third, fourth and more servings are just simply included in the price so you can get as many servings as you can handle. Two is the absolute maximum I ever did but I definitely saw some locals eat twice as much as I could. Dal Bhat gives you strength without making you feel overstuffed and heavy. 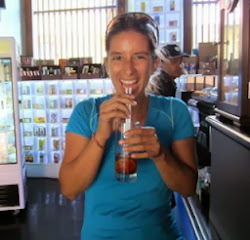 We enjoyed eating it and it is definitely a healthy food choice. There are enough carbs in Dal Bhat to fill you up, allowing your body to convert them to sugars to power up your day. Since we trekked for 33 days straight and also went on a 10-day rafting trip, Dal Bhat definitely came in handy plus our guides all swore by it -- Energy Bars would face stiff competition in Nepal! The main problem I personally have with Dal Bhat is that it is eaten every single day for lunch (served at 10 am) and for dinner (served around 7pm). 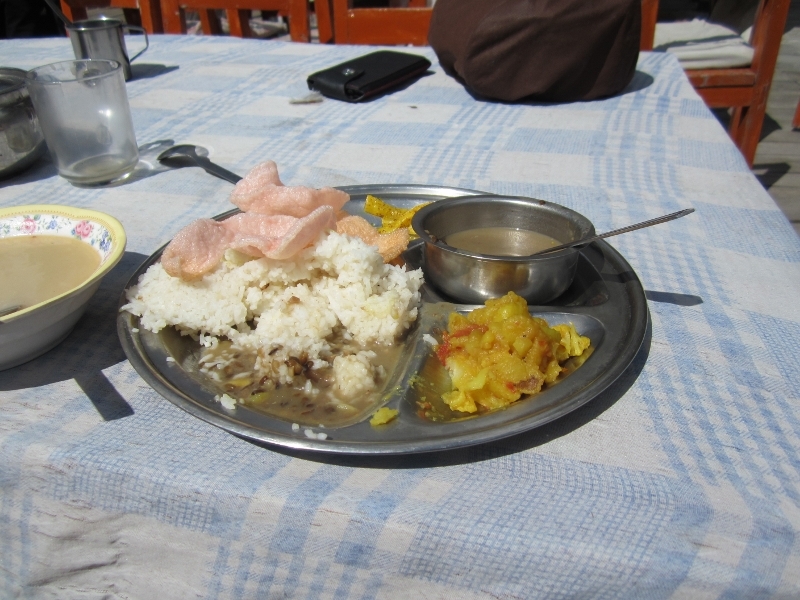 Nepalis seem to be perfectly content eating Dal Bhat twice a day, every day for eternity. For example, when we started our trek, our guide told us that he and our porter were looking forward to having Dal Bhat twice a day, every day for the entire length of the 33-day trek even though there were many other options. They actually did this! 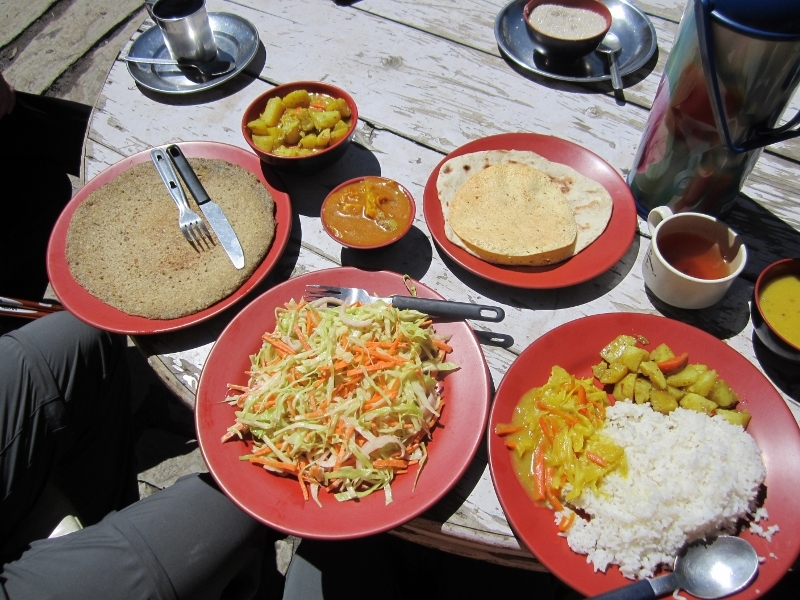 Our whitewater rafting guides would cook us really good meals when we camped: fried fresh caught fish, lasagna and curries but sometimes they would cook Dal Bhat separately and eat that instead. Moderation is key, even for Dal Bhat! I know this was posted some time ago Andrea but I understand what you mean because growing up as a boy in England I used to regard dal bhat as the most boring and bland thing ever. One of the best things about being an adult was that I'd never have to eat it again. The funny thing though is now that I'm approaching my fifties I seem to be reverting back to my mum's cooking and actually enjoy dal bhat...every now and again at least!